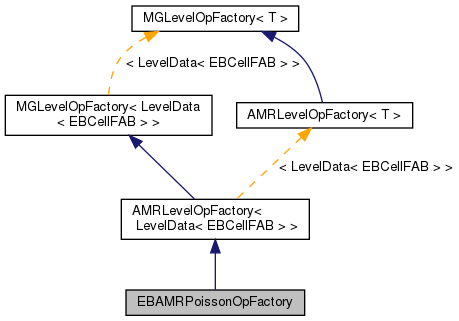 Factory class to generate EBAMRPoissonOps. This follows the AMRLevelOpFactory interface. a_eblgs : layouts at each AMR level \ a_domainFactory : domain boundary conditions \ a_ebBCFactory: eb boundary conditions \ a_dxCoarse: grid spacing at coarsest level \ a_origin: offset to lowest corner of the domain \ a_refRatio: refinement ratios. refRatio[i] is between levels i and i+1 \ a_preCondIters: number of iterations to do for pre-conditioning \ a_relaxType: 0 means point Jacobi, 1 is Gauss-Seidel, 2 is line solver. \ a_alpha: coefficent of identity \ a_beta: coefficient of laplacian.\ a_time: time for boundary conditions \ a_ghostCellsPhi: Number of ghost cells in phi, correction (typically one)\ a_ghostCellsRhs: Number of ghost cells in RHS, residual, lphi (typically zero)\ Ghost cell arguments are there for caching reasons. Once you set them, an error is thrown if you send in data that does not match. Use numlevels = -1 if you want to use the size of the vectors for numlevels.